Status: Rare casual spring and fall migrant statewide. State and federally listed as Threatened. Documentation: Photograph: 5 Sep 1986 Lake Babcock, Platte Co (Mollhoff 1987). Taxonomy: Six subspecies are currently recognized, although Pyle (2008) combined at least the North American breeders. Three of the subspecies are Eurasian. Those breeding in North America are roselaari in northwest Alaska, rufa in northern Canada, and islandica on islands off northeast Canada and Greenland (Gill and Donsker 2017). An additional eight reports are probably correct: 30 Apr 1994 Dixon Co, 10 May 1943 Douglas Co (Haecker 1943), 15 May 1975 Douglas-Sarpy Cos, 16 May 1896 Lancaster Co (Bruner et al 1904), 18 May 1986 Lincoln Co, 19 May 1963 Lancaster Co, 22 May 1997 Garden Co, and 23 May 1993 Keith Co (Rosche 1994). The above dates, along with an early date 4 Aug 1978 Box Butte Co (Rosche 1982; Bray et al 1986) and a later date 1 Nov 1963 (Shickley 1964) are the limiting dates of the 20 documented records. An additional eight reports may be correct: 25-27 Aug 1989 Keith Co (Rosche 1994), 27 Aug 1896 Lancaster Co (Bruner et al 1904), 31 Aug 1986 Polk Co, 7 Sep 1975 Lancaster Co, 18 Sep 1976 Lancaster Co (Williams 1977), 30 Sep 1893 Douglas Co (Bruner et al 1904), Oct 1874 Nemaha Co (Bruner et al 1904), and 30 Oct 1977 Lancaster Co. Comments: Recent work using geolocators (Newstead et al 2013) shows that some rufa Red Knots that winter along the northwest Gulf Coast migrate through the Interior in both spring and fall. However, migration in spring involved non-stop flights from wintering sites to stopover sites in the northern Great Plains, thus over-flying Nebraska. Similarly, in fall, birds flew non-stop from James Bay, Manitoba, to the Gulf Coast. The tendency of this species to fly over Nebraska explains its rarity. In addition, O’Brien et al (2006) suggested that some roselaari migrate to the Atlantic Coast beginning in Jul and remaining until Sep, possibly providing Nebraska records. Two roselaari originally banded on the Pacific Coast were subsequently re-sighted on Padre Island, Texas, (Carmona et al 2013) thereby indicating some birds of this subspecies appear to migrate through the Interior. It has been suggested that Red Knots wintering in Florida and on the Gulf Coast may be roselaari, but the genetic identity and migration pathways of these birds are currently unknown (Baker et al 2013). 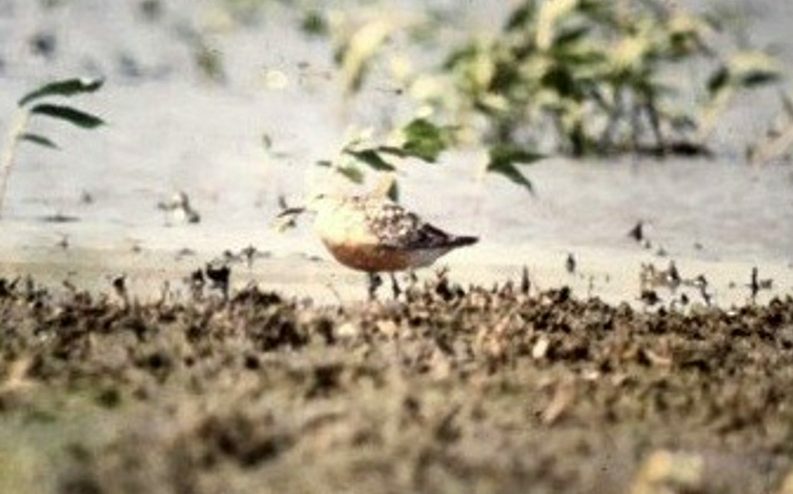 The migratory routes used by subspecies and populations of Red Knot will likely continue to be clarified in the future. In 2015, the U.S. Fish and Wildlife Service listed rufa Red Knot as threatened under the Endangered Species Act and included Nebraska within the geographic range of the species even though it is less than regular in occurrence. Carmona, R., N. Arce, V. Ayala, A. Hernández-Alvarez, J.B. Buchanan, L.J. Salzer, P.S. Tomkovich, J.A. Johnson, R.E. Gill Jr., B.J. McCaffery, J.E. Lyons, L.J. Niles, and D. Newstead. 2013. Red Knot (Calidris canutus roselaari) migration connectivity, abundance and nonbreeding distribution along the Pacific coast of the Americas. Wader Study Group Bulletin 120: 168-180. Haecker, F.W. 1943. An American Knot visits Omaha, Douglas County. NBR 11: 20. Jorgensen, J.G. 2004. An overview of shorebird migration in the eastern Rainwater Basin, Nebraska. Occasional Paper #8, Nebraska Ornithologists’ Union, Lincoln, Nebraska, USA. Newstead, D.J., L.J. Niles, R.R. Porter, A.D. Dey, J. Burger, and O.N. Fitzsimmons. 2013. Geolocation Reveals mid-continent migratory routes and Texas wintering areas of Red Knots Calidris canutus rufa. Wader Study Group Bulletin 120: 53–59. Shickley, G.M. 1964. Knots in Lincoln County. NBR 32: 62-63. Silcock, W.R. 2005. Spring Field Report, March-May 2005. NBR 73: 46-67.